An entry of 1,610 sheep in Markethill on Wednesday, April 3 included 1,150 fat hoggets which sold in a noticeably firmer trade. Heavy hoggets sold steadily from £103 to £110 each and the total entry of 850 heavy hoggets averaged 28 kilos at £106.30 each 380p per kilo. Top quality pens sold steadily from 380p to 429p per kilo for 24k at £103 each followed by 426p per kilo for 39 hoggets 24.9 kilos at £106 each. Middleweight hoggets sold to a top of 460p per kilo for 21.5 kilos at £99 each followed by 454p per kilo for 21.8 kilos at £99 each. All good quality middleweights sold from 400p to 450p per kilo with 200 middleweight hoggets averaging 22.2 kilos at £96.50 each 433p per kilo. An increased entry of 230 cull ewes returned a firmer trade with heavy ewes selling steadily from £80 to £108 each. Second quality ewes sold from £55 to £70 each. An increased entry of ewes and lambs sold in probably the best trade so far this season. A two year old ewe with two lambs sold at £310 with several more doubles selling at £290, £278, £275 and £258 each. Singles sold to a top of £260 with others at £248, £245 and £240 each. Portadown farmer: 24k, £103, 429p; Aughnacloy farmer: 24.9k, £106, 426p; Armagh producer: 25k, £106, 424p; Armagh farmer: 24.2k, £102, 421p; Annalong farmer: 25k, £104.50, 418p; Mowhan producer: 26k, £107, 412p; Armagh farmer: 24.8k, £102, 411p; Markethill producer: 25.5k, £104, 408p; Newtownhamilton farmer: 26.1k, £106 ,406p and Tandragee farmer: 26.5k, £107, 404p. 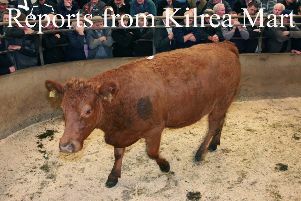 Tandragee producer: 21.5k, £99, 460p; Newtownhamilton farmer: 21.8k, £99, 454p; Collone producer: 21.9k, £99, 452p; Armagh farmer: 22.1k, £98.50, 446p; Loughbrickland farmer: 21.5k, £94.40, 439p; Markethill producer: 22.1k, £97, 439p; Newtownhamilton farmer: 23.7k, £104, 439p; Jerrettspass farmer: 20.4k, £88, 431p; Armagh producer: 22.5k, £97, 41p and Poyntzpass farmer: 23.2k, £100, 431p.